It takes 1,600 litres of water to produce one kilo of bread. This is the type of calculation used to measure a water footprint, the total volume of freshwater used to produce the goods and services consumed by people and communities. A water footprint can be applied to countries as a whole, or to specific industries or economic activities, such as mining or agriculture. The countries of Mesoamerica, however, have made no attempt to calculate this indicator, beyond a few isolated initiatives. The region, made up by the southern states of Mexico and the seven countries of Central America, is generally rich in freshwater, but is extremely vulnerable to changes which, in the medium to long term, could diminish its availability. Waste, pollution and lack of governance pose serious threats to the supply of this precious resource, sources consulted in Mexico, Guatemala and El Salvador told Tierramérica. Non-governmental organisations from the region plan to denounce this situation at the 6th World Water Forum, taking place Mar. 12-17 in Marseille, France. In Mexico, poor water management 'is reflected by pollution and inequality in its distribution between different uses, between urban and rural areas, and between cities,' said Claudia Campero, Latin American regional coordinator for the Blue Planet Project, a global initiative based in Canada that works with partners around the world to protect the right to water. Some 500,000 agricultural irrigation users consume 32 million cubic metres of water annually in this country of 107 million people, according to the National Water Commission of Mexico. At the same time, however, 30 percent of Mexican households do not have piped water and 15 percent receive water through other means only every three days, according to the National Institute of Statistics and Geography. Access to drinking water is a basic human right, recognised by the United Nations through a General Assembly resolution in 2010. The UN has also declared it to be a legally binding right, which means that all member countries are obliged to incorporate it in their constitutions and national legislation. Mexico must now reform the National Water Law in order to adapt it to the changes made in its constitution. Guatemala and El Salvador do not even have this type of legislation. In Guatemala, agriculture accounts for 40 percent of the freshwater consumed, households use another nine percent, and other sectors, including industry, make up a combined share of three percent. The remaining 48 percent goes to so-called non-consumptive uses, primarily the generation of hydroelectric power, according to the Secretariat of Planning and Programming of the Presidency. Although the country’s freshwater supply is sufficient in general, the Corredor Seco (Dry Corridor) area of central and eastern Guatemala is characterised by recurring droughts in the Northern hemisphere summer months and semi-arid soils with low crop yields. Unsurprisingly, the region has been repeatedly hit by food crises and suffers high rates of malnutrition, sometimes even fatal. Some efforts have been made to improve water management in the country, said Ever Sánchez of the non-governmental Water and Sanitation Network of Guatemala. 'A specific government department was created to foster better interinstitutional coordination and develop a water policy,' he reported. Nevertheless, serious problems persist in the management of household and industrial wastewater and solid waste. El Salvador is the only country in Central America with a shortage of water, according to the report 'Situación de los recursos hídricos en Centroamérica: hacia una gestión integrada' (Water Resources Situation in Central America: Towards Integrated Management), published in April 2011 by the Global Water Partnership (GWP). With access to 1,700 cubic metres of water per person per year, El Salvador is very close to the water security threshold of 1,500 cubic metres per capita. Agriculture accounts for 70 percent of consumption, and no water-saving mechanisms have been established in the sector, says the Salvadoran Ecological Unit (UNES), an NGO that forms part of the National Forum for the Defense of Sustainability and the Right to Water. The agricultural sector is also one of the biggest polluters of rivers and lakes, where the residues of chemical fertilisers and pesticides end up. In addition, only five percent of industrial wastewater undergoes any kind of treatment, said the president of UNES, Ángel Ibarra. The Ministry of Environment and Natural Resources of El Salvador has not moved beyond the stage of formulating proposals, such as the National Water Resources Policy, which have yet to be followed up with any concrete measures. Policies in the region tend to follow 'a mercantile model that does not tackle environmental problems or inequality, and which promotes the entry of private enterprise in the construction of infrastructure, administration and management,' said Campero, who will be attending the World Water Forum in Marseille. In the absence of an intergovernmental mechanism within the United Nations system, these international conferences organised every three years by the World Water Council have gained significant prominence, bringing together governments, multilateral agencies, NGOs and private companies. The 12 priorities for action established for the 6th World Water Forum include guaranteeing access to water for all and the right to water; preventing and responding to water-related risks and crises; adjusting pressures and footprints of human activities on water; and promoting green growth and valuing ecosystem services. An estimated 900 million people in the world do not have access to clean water. They believe that the issue of water should be discussed instead at the United Nations Conference on Sustainable Development, better known as Rio+20, taking place this June in Rio de Janeiro, Brazil. 'We civil society organisations are going to call for the creation of a United Nations agency and an international convention aimed at the sustainability of water resources,' said Ibarra. For his part, Rubén Pérez of the Guatemalan Association of Sanitary and Environmental Engineering hopes that the World Water Forum will address the need to treat wastewater and guarantee sanitation services. 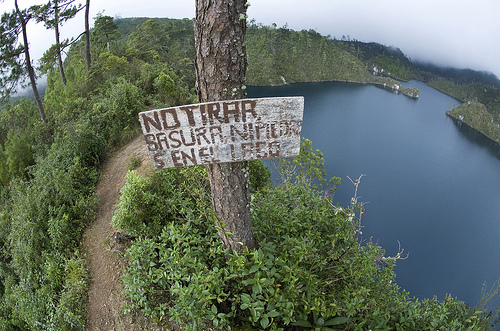 In Guatemala, less than five percent of wastewater is treated. And the second leading cause of infant morbidity and mortality is contact with unsafe water. The World Water Forum should also emphasise the urgent need to guarantee water resources in order to combat food insecurity in places like the Corredor Seco in Guatemala. 'How is it possible that more than 50 percent of the country’s children are malnourished? Food and water are inseparable,' declared Pérez. * Additional reporting by Danilo Valladares (Guatemala City) and Edgardo Ayala (San Salvador). This story was originally published by Latin American newspapers that are part of the Tierramérica network. Tierramérica is a specialised news service produced by IPS with the backing of the United Nations Development Programme, United Nations Environment Programme and the World Bank.